One tradition on every trip to Walt Disney World is The Signing of the “cards” or correctly the signing of “Your Key to the World” cards. Each trip when we check in at our Disney Vacation Club resort we get our “Welcome Home” package of information and our valuable Your Key to the World cards. Everyone in the room gets their own personalized card. The Your Key to the World card is your room key and much more. It is your identification card that says you are a guest at Walt Disney World. And it has an arrow on the front to show you which direction to insert it into your door lock so you can actually get into your room. Your Key to the World card can also be your Park Ticket. If you have purchased tickets as part of your vacation package your card is your admission to the Parks. If you have your admission ticket on your card it can be used to obtain the all important FassPass for your favorite attractions. If you have purchased one of the Disney Dining Plans, Your Key to the World card is also your “meal ticket”. The card identifies you are on the dining plan and you use your card to redeem you meal credits. If you put up a credit card on your stay for “incidentals”, the Your Key to the World card may also be used to charge back to your room anything you want to purchase in the parks. Shopping, Dining, or snacks. Everywhere in The World allows you to charge back to your room, including most all of the food carts. Your Key to the World is plastic, like a credit card, and includes a magnetic strip on the back as well as the box for you to sign your card. When you check in and put a credit card on your account you may designate which cards may have charging privileges. I have always allowed charging for all my family. I have always let the kids know they may use the card if necessary to buy something to eat, but I don’t remember if anyone has used it for that. Amy and Ridge have always been very responsible with their cards. So since this is a charge card, everyone must sign their card the first thing when I pass out the cards. It has become the tradition that says “Welcome Home” you have arrived at Walt Disney World. Your vacation trip has begun. This is a tradition that continues even though my children are adults on their own. But when they come with me to Walt Disney World I still give my children charging privileges on the room. They might get caught out without any money and get hungry. ;-) And so when we arrive and I hand out the Cards, everyone must take time to sign them, and once they do, our vacation has officially begun. I don't seem to be without my card, even after we come home. The one pictured above is from our last trip. It has been in my wallet with all my "stuff" since the trip. I took it out just to take it's picture. It seems like it stays there until I get my next "Welcome Home" packet and a new Your Key To the World card. And I can always pull it out, remember the last trip and dream of our next. What Traditions does your family have on your trips to The World? Disney Dad- that's awesome! I love it!! I'm still thinking of that one special and unique tradition we have! thanks. Just found your blog via the button on "Jackie's Magical Moments" blog. I, too, am a Disney fanatic. I grew up going there, I worked there, and now I enjoy taking my kids there. What a fun tradition. I would never have thought of such a small gesture being such a unique tradition. We go to Biergarten each time we go with the kids. I would like to start some more "traditions" each time. Well, you definitely have a new follower in me...PS LOVE, LOVE, LOVE the header artwork! So sweet! Hello! 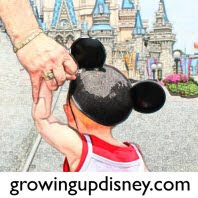 Allison and Welcome to Growing Up Disney! Check out the tabs at the top of the page and read about "The Family behind the Blog" to get to know us. We are coming up on one year old! So there are a lot of past posts Amy is our editor-in-chief and is in charge of things around here. Ridge (aka Chris) gives his unique view on The World has just gotten back from WDW on a solo trip and has some great pictures posted. I'm dad to them and get to hang out around here and try to help out. Our tradition is simple...we have a family picture taken in front of the castle. Since we travel to Disney so frequently, it's fun to watch the family portraits change over time. I still have my last Key to the World in my wallet now, can't think of going anywhere without it. Luckily, I get a new one next week! !